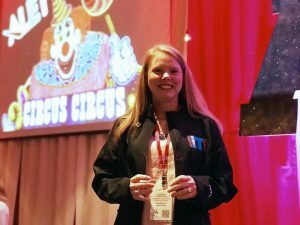 Jennifer Alexiou-Ray, associate professor in the College of Education at the University of Montevallo, was recently awarded the International Society for Technology in Education (ISTE) Making It Happen Award at the annual Alabama Leaders in Educational Technology (ALET) conference. Alexiou-Ray now joins the ranks of the only 600 educators from across the world to have received this award since its inception in 1995. 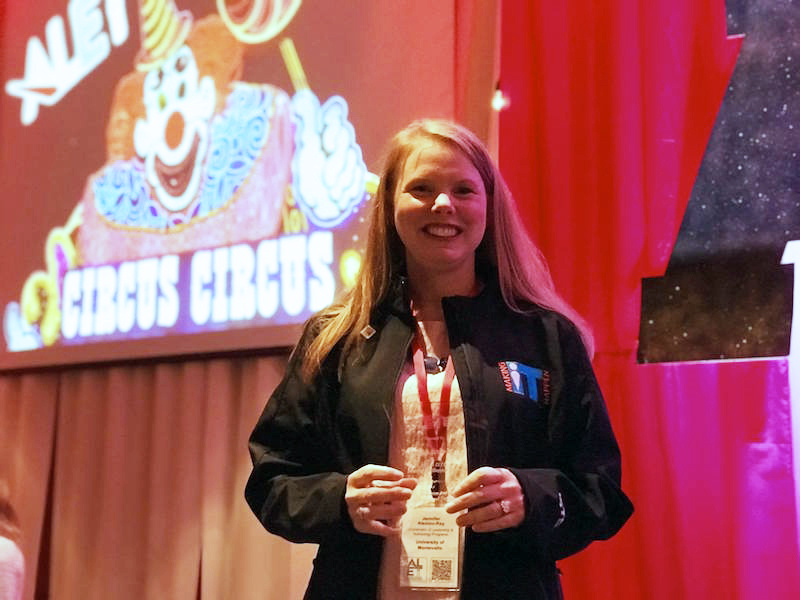 The ISTE Making It Happen Award honors outstanding educators and leaders from across the world who demonstrate extraordinary commitment, leadership, courage and persistence in improving digital learning opportunities for students. “I am honored to have received this distinguished award from the ALET organization,” stated Alexiou-Ray. “There are so many accomplished professionals that are part of this organization and I am humbled to work with them in service to the students and families of our state,” she added. The ALET serves as the ISTE affiliate, with both organizations being dedicated to promoting the positive impact of technology in education. Sara Carpenter, technology coach for Hoover City Schools and former student of Alexiou-Ray, nominated her for the award. “I was inspired to nominate Dr. Alexiou-Ray for the ISTE Making It Happen award because of my experience getting to know her as my advisor through the University of Montevallo’s Ed. S. Instructional Technology program. She worked tirelessly to give us the best experience by connecting us with other students in the program and to make it applicable to our current teaching situations,” said Carpenter. After graduating from Thompson High School in 1998, Alexiou-Ray went on to earn a bachelor’s degree in secondary education and teaching/social sciences, a master’s degree in educational/instructional technology and educational leadership and a doctorate in instructional leadership/technology from the University of Alabama. Alexiou-Ray joined the University of Montevallo in 2010 and currently serves as the Associate Professor of Secondary Education/Instructional Technology, Coordinator of Instructional Technology & Leadership Programs, Graduate Council Chair, 2018-2019 Provost Fellow for Graduate Studies, and Principle Investigator for GEAR UP Jefferson County. Dr. Alexiou-Ray’s prior education positions include working in K-12 schools such as Shelby County, Mountain Brook City, and Vestavia City School Systems. These positions allowed Alexiou-Ray the opportunity to work with large-scale technology initiatives, train teachers in using technology with their students, and working day-to-day with teachers and students helping them to use technology while learning. In addition to teaching in technology, Dr. Alexiou Ray has trained to facilitate and develop online professional development for the State of Alabama eLearning program.